1Department of Social and Health Sciences, University of Murcia, Murcia, Spain. Objectives: Adverse drug reactions (ADRs) are an important cause of morbidity and mortality worldwide and generate high health costs. Therefore, the aims of this study were to determine the treatments which produce more ADRs in general population and the main symptoms they generate. Methods: An observational, cross-sectional study consisting in performing a self-rated questionnaire was carried out. 510 patients were asked about the treatments, illnesses and ADRs, they had suffered from. Results: 26.7% of patients had suffered from some ADR. Classifying patients according to the type of prescribed treatment and studying the number of ADR that they had, we obtained significant differences (p ≤ 0.05) for treatments against arthrosis, anemia and nervous disorders (anxiety, depression, insomnia). Moreover, determining absolute frequencies of these ADRs appearance in each treatment, higher frequencies were again for drugs against arthrosis (22.6% of patients treated for arthrosis suffered some ADR), anemia (14.28%), nerve disorders (13.44%) and also asthma (16%). Regarding the symptoms produced by ADRs, the most frequent were gastrointestinal (60% of patients who suffered an ADR, had gastrointestinal symptoms) and nervous alterations (dizziness, headache, sleep disturbances etc) (24.6%). Conclusion: Therapeutic groups which produce more commonly ADRs are those for arthrosis, anemia, nervous disorders and asthma. In addition, symptoms which are generated more frequently are gastrointestinal and nervous problems. This is in accordance with the usual side effects of mentioned treatments. Health professionals should be informed about it, so that they would be more alert about a possible emergence of an ADR in these treatments. They also could provide enough information to empower patients and thus, they probably could detect ADR events. This would facilitate ADR detection and would avoid serious consequences generated to both patients' health and health economics. Key words: Adverse drug reaction, drug therapy, symptoms, frequency, chronic disease. Introducción: Las Reacciones Adversas a Medicamentos (RAM) constituyen una importante fuente de morbilidad y mortalidad en todo el mundo, generando altos costes económicos. Por ello, el objetivo de este estudio fue determinar aquellos tratamientos que producen una mayor cantidad de RAM en la población general así como conocer los principales síntomas que generan. Material y métodos: Se realizó un estudio transversal observacional mediante la cumplimentación de un cuestionario. Para ello, 510 pacientes fueron encuestados sobre qué patologías tenían diagnosticadas, sus tratamientos farmacológicos y las RAM sufridas. Resultados: Un 26,7% de los pacientes encuestados había sufrido alguna RAM. Obtuvimos resultados estadísticamente significativos (p ≤ 0.05) al clasificar a los pacientes según el tratamiento prescrito y el número de RAM sufridas para los tratamientos farmacológicos de artrosis, anemia y enfermedades del sistema nervioso (ansiedad, depresión, insomnio). Además cuantificamos frecuencias de aparición de RAM mayores en aquellos fármacos prescritos contra la artrosis (22,6% de los casos sufrieron RAM), anemia (14,28%), alteraciones nerviosas (13,44%) y asma (16%). En cuanto a los síntomas producidos, los más frecuentes fueron gastrointestinales (60% de los pacientes) y alteraciones nerviosas (mareos, dolor de cabeza, problemas de conciliación del sueño etc, 24,6%). Discusión: La principal conclusión de nuestro estudio es que aquellos fármacos que producen mayor número de RAM están prescritos para el tratamiento de la artrosis, la anemia, las alteraciones nerviosas y el asma. Además, los síntomas que aparecen principalmente tras una RAM son alteraciones gastrointestinales y nerviosas. Los profesionales sanitarios deberían estar alerta ante la posible aparición de RAM en dichos tratamientos y proporcionar a sus pacientes el empoderamiento necesario para que ellos mismos pudieran detectarse RAM. Esto evitaría consecuencias negativas tanto en su estado de salud como en el gasto sanitario. Palabras clave: reacciones adversas, farmacoterapia, síntomas, frecuencia, enfermedad crónica. Adverse drug reactions (ADRs) are an important cause of morbidity and mortality worldwide1-4 and generate high health costs5-7. There are many different definitions but the most accepted is granted by the World Health Organization (WHO), and is defined as any noxious, undesirable reaction that occurs with the doses used routinely in humans for the treatment, prophylaxis or diagnosing a disease8-10. It is estimated that between 1 and 4% of consultations in emergency services and about 2.5% of the extra-hospital consultations are due to ADRs11. In a study conducted in 2014 in Czech Republic, it was found that 2.2% of hospital admissions were due to an ADR12. On the other hand, between 0.3 and 6% of hospital admissions and 0.2 and 3% of hospital deaths are attributable to ADRs11. ADR detection and notification is vital since ADR appearance is a significant cause of morbidity, hospitalization and extension of its length, increased healthcare spending cost and what is more important, patient's death. Therefore, it would be really interesting to determine those treatments that generate ADR more often. In this way it could be carried out measures to enhance the precautions in these pharmacological treatments, the information provided by the physicians and thus, to reduce ADR and hence its serious consequences. Moreover, if we would be able to determine the main symptoms generated by each ADR, they could be more quickly detected. For all these reasons, the aims of our study were to determine the treatments which produce more ADR events in the population and the main symptoms they generate. An observational, cross-sectional study was carried out between 1 September and 1 November 2013. This study consisted in performing a self-rated questionnaire completed by a sample of 510 randomly distributed people. Patients were invited to participate in the study, after hearing a description of the project and providing verbal consent. 286 patients were surveyed in a community pharmacy, and 224 patients in 8 Health Centers placed in different health areas of Region of Murcia. Among these 8 Health Centers, there were: 2 Hospitals, 5 Health Centers and 1 clinic. Two of these Care Centers were providing services of private healthcare and the remaining 6 were providing public healthcare. By developing our study in these health centers, we covered three health areas of the Region de Murcia: health area I (Murcia / West), health area VI (Vega Media of the Segura) and health area VII (Murcia / East). In this way, we can ensure that we cover a wide range of the population, with different cultural and economic level. A pilot questionnaire was designed by the research team, pretested to suit the aims of the study. The questionnaire was structured into two blocks of 3 questions each one. Firstly, we asked patients about their illnesses and treatments. They were asked if they took drugs daily, how long before they were in chronic treatments and for which illnesses. Secondly, we asked them if they had suffered any ADR, if so, which drug generated that ADR and which symptoms they had. Data on gender, age, nationality, educational level and profession were also collected. Results were analyzed using the statistical package SPSS 19.0 data. It was conducted a univariate analysis which consisted in collecting absolute and relative frequencies distribution (in percentage), as well as descriptive statistics (mean, standard deviation, median, mode) of each variable. We also conducted a bivariate comparison of the association among all the variables, looking for possible associations, using Pearson's Chi-squared test. 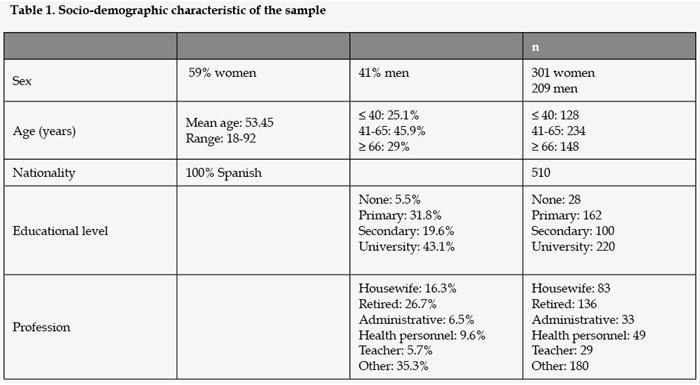 The socio-demographic characteristic of the sample are depicted in Table 1. From the initial sum of 510 patients, 364 (71.4%) consumed drugs daily. The period of time that these patients were consuming drugs daily is shown in Table 2. The most consumed drugs were those for hypertension and for infections. All treatments prescribed are shown in Table 3. From 510 patients, 130 (25.5%) said that they had suffered from some ADR. However, some of them had suffered from more than one ADR, so the total number of ADR events was 170. We study ADR incidence according to three variables: consuming or not drugs daily, length and kind of pharmacological treatment. We found significant differences in ADR incidence distribution depending on whether patients consumed drugs daily (p<0.001). In contrast, there were no significant differences regarding to the length of the different treatments. Therefore, patients with chronic treatment are more likely to suffer an ADR, regardless of chronic treatment length. 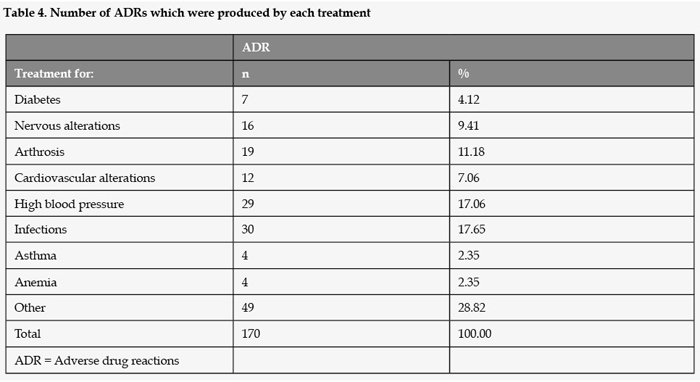 Studying ADR incidence according to the type of treatment, the highest number of ADRs appeared in patients with anti-infective and anti-hypertension treatments, as it is shown in Table 4. However, classifying patients according to the type of prescribed treatment and studying the number of ADR that these patients had to the treatment, we obtained different results. Using Pearson's Chi-squared test, we found significant differences (p ≤ 0.05) for treatments against arthrosis, anemia and nervous disorders (anxiety, depression, insomnia). Moreover, determining absolute frequencies of ADR appearance in each treatment (in relation to the number of patients who consumed it) treatments which showed higher frequencies were those against: arthrosis (22.6% of patients treated for arthrosis suffered an ADR), anemia (14.3%), nervous disorders (13.4%) and asthma (16%). Therefore there would be a higher probability of developing an ADR for patients with such pharmacological treatments. Regarding the symptoms produced by different ADRs, gastrointestinal disorders were the most frequent (60% of patients who suffered an ADR, had gastrointestinal symptoms) followed by nervous alterations (dizziness, headache, sleep disturbances etc), (24.6%). Once data from surveys were gathered, we realized the great number of patients with chronic treatments (71.4%). Thus, to estimate the relation between being in chronic treatment and suffering an ADR event could be interesting. We did that analysis obtaining that there were more probabilities of suffering an ADR if patients were in a chronic treatment. This is because so many drugs generate ADR when they are used in a long term. However, there were no significant differences regarding the length of the chronic treatment. As it is shown in Results, 170 ADR happened. The number of ADR cases was higher for antibiotics (17.65%) and for antihypertensive treatment (17.06%). In part, this is because these treatments are two of the most administered treatments. In this way, among respondents in our sample, there were a great number of patients with these treatments, 480 surveyed had been in a treatment containing antibiotics and 219 in an antihypertensive treatment. Scientific literature widely documents the current overuse of antibiotics13, 14 and recent studies have determined that antibiotics are the most frequently prescribed drugs15. On the other hand, high blood pressure is a major public health problem and a leading risk factor for cardiovascular disease and mortality16-18. One-quarter of the world's adult population has hypertension16 and more than 7 million of deaths can be attributed to the effects of hypertension17. At 65 years, individuals have a 90% chance of developing hypertension at the time they reach 80 years of age17. Therefore, being these two treatments so much used, the incidence of an ADR event seems to be higher. Then, we had to relate ADR incidence of each treatment and the number of patients in that treatment. Thus, it is seen an increased occurrence of ADR in drugs administered against asthma, arthrosis, anemia and nervous disorders (anxiety, depression, insomnia), appearing significant differences for the last three. This ADR increase to these treatments can be explained in some sense for the following reasons. Regarding to arthrosis, it is a degenerative joint disease that causes cartilage wear. Pain, stiffness and functional disability take place19. The main treatment consists in administration of analgesic-antiinflammatory drugs. Paracetamol and non-steroidal antiinflammatory drugs (NSAIDs) are among these drugs and they are widely used19. The latter are drugs which suppress the synthesis of cyclooxygenase enzyme (COX). This enzyme converts arachidonic acid (which is obtained from membrane phospholipids) to different eicosanoids compounds. Prostaglandins, thromboxanes and leukotrienes are among these compounds, and they are important mediators of inflammatory processes and others20-24. Thus, inhibiting the synthesis of COX, we reduce the levels of these mediators and therefore inflammation decreases. However, the isoenzyme COX 1, which is the constitutive isoform in our organism, participates in body homeostasis, keeping the integrity of the gastric mucosa, among other functions. Therefore, the suppression of COX by NSAIDs is associated with several gastrointestinal disorders: esophagitis, gastritis, mucosal erosions, peptic ulcer, esophageal stricture, alterations in gut permeability, etc. NSAID gastrointestinal pathology accounts for over 70000 hospitalizations and over 7000 deaths annually in the United States25. It is estimated that one in every five patients treated with NSAIDs for more than three months, develop gastric ulcers 21. Another pathology which presented greater percentage of ADR is anemia. This disorder usually produces a decrease in the number of red blood cells. It is due mainly to deficient levels of iron and its treatment is, therefore, administration of iron salts26. These iron compounds, such as ferrous sulfate, generate gastrointestinal disorders, which often result in low adherence27. Constipation and diarrhea are common disorders. Other symptoms include poor appetite, dark colored stools, nausea and vomiting. Such gastrointestinal disorders are due to high oxidative potential of iron which can result in the formation of reactive oxygen species28. Regarding the treatment of nervous disorders, we included in that group: anxiety, depression and insomnia. Benzodiazepines are the main treatment for anxiety and insomnia while for depression disorder selective serotonin reuptake inhibitors (SSRIs) are the most frequently prescribed antidepressants. It is due to their superior clinical efficacy, effectiveness, tolerability and safety compared to tricyclic antidepressants or monoamino oxidase inhibitors29, 30. On the one hand, benzodiazepines are drugs which act on the central nervous system, enhancing the inhibitory action of neurotransmitter GABA. Thus, it generates a hypnotic, anticonvulsant, sedative, muscle relaxant and amnesic action. By its action mechanism also generates numerous adverse effects such as sedation, reduced alertness, fatigue, headache, drowsiness, ataxia, confusion, depression, dizziness, etc.29, 31-34. On the other hand, SSRIs work by selectively blocking the presynaptic reuptake of serotonin in the brain stem and spinal cord, thereby making more serotonin available, which in turn improves mood and behavior. Nevertheless, some adverse drug reactions can arise during SSRI treatment as nausea, diarrhea, headache, insomnia, nervousness, tachycardia etc.29, 30, 35. In this way, we can see that since these drugs act on the central nervous system, they produce lots of effects on the organism, and therefore, they are among the treatments that generate more ADR in our study. Finally, about asthma, it is a chronic allergic respiratory disease characterized by inflammation of bronchial walls and reversible airway obstruction36, 37. Asthma is a long-term disease that has no cure. The goal of asthma treatment is to control the symptoms. There are two types of treatments, long-term and short term control drugs. Most of the people who have asthma need to take long-term control medicines daily to avoid and prevent symptoms, and all people who have asthma need quick-relief medicines to help relieve asthma symptoms that may flare up. Inhaled corticosteroids are the preferred medicine for long-term control of asthma, and inhaled short-acting β2-agonists are the first choice for quick relief. Concerning to inhaled corticosteroids, besides the beneficial effects, thrush frequently occurs and if taken for long periods, these medicines raise your risk to suffer from cataracts and osteoporosis38. This reasoning about drugs which result in more ADR, also explain that the most frequent symptoms were gastrointestinal symptoms (60% of patients), followed by nervous disorders (24.6%), since they are the problems which are generated by three of four groups of drugs that more ADR produce in relation to the number of patients. Studies made in Spain and United States, found nervous disorders and gastrointestinal symptoms among the more frequency alterations caused by ADRs as well25, 39. Therapeutic groups which produce more commonly ADRs are those for arthrosis, anemia, nervous disorders and asthma. In addition, symptoms which are more frequent when patients suffer from an ADR are gastrointestinal and nervous disorders. This is in accordance with the usual side effects of mentioned treatments due to its action mechanism. Health professionals should inform about it, so that they are more alert to a possible emergence of an ADR in these types of treatment and will provide sufficient information to empowder patients in order to detect themselves to be suffering an ADR. This would facilitate ADR detection and would avoid serious consequences to both patients' health and health economic costs. No funding agency for the research work.